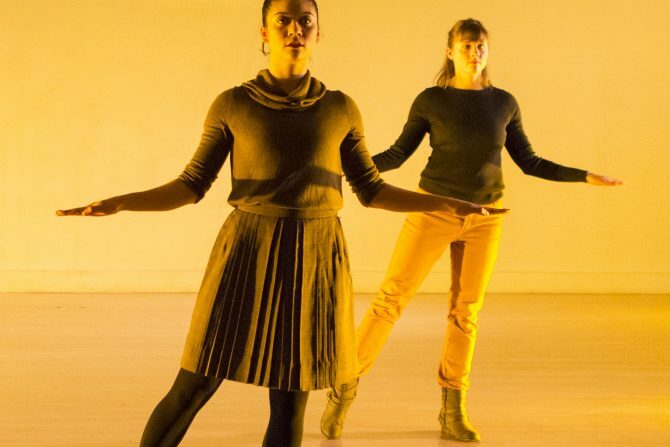 It’s been a marvelous winter for vintage dancers, from the aMID festival at Links Hall north to Evanston where Northwestern University hosted Simone Forti for a residency, showing of her work in progress and performance of her groundbreaking dance construction Huddle. In these presentations, every one of the choreographers and performers is creating thought provoking work in the grey of winter, work that asks focus and intention of the audience and dancer alike, and rewards us all with the warmth of wisdom. Zephyr and Smith /Wymore Disappearing Acts offered a revolving program at Links Hall: on the night I attended I witnessed the wordy, nerdy, funny person against machine piece Human Apparatus, created and performed by one time Chicagoans Shelden Smith and Lisa Wymore. The work is a hypochondriac’s dream—with various digital sensors and whimsy giving ongoing feedback. Of course, it appears, in this excerpt, that the helmets meant merely to sense begin to control, and there are hints of a political statement. I can’t wait to see the fully fleshed out piece by these witty dancer/choreographers. Zephyr contributed Michelle Kranicke’s Study #2, a cerebral, geometric work, a logarithm for three bodies (Kranicke and fellow navigators Sabrina Baranda and Molly Strom) that engages the mathematical mind like a Steve Reich composition. The program switches gears with Pranita Jain’s What the Body Remembers, a colorful highlight of the evening. Jain masterfully manipulates the traditional form of classical Indian dance to make a statement about wisdom and grace. She is mirrored by the brand new performer Manou Chakrovarty who appears with her, at once a mirror to the mature dancer and a bridge to the future. Bebe Miller then took the stage with Darrell Jones in a delicous improvisation they called Duet with a Piece of String. This mostly successful romp of searching and finding was an exposition of trust and conversation. There is a sheer joy watching masters at play. I had this piece clearly in mind while watching Simone Forti at Northwestern a few days later. Forti, now in her 80’s with movement colored by a Parkinson’s shake, was a seminal member of the Judson Church improvisers. She was in residence at Northwestern and presented her thoughts and work in a presentation called Thinking with the Bodyin the old Roycemore gy, now a performance space/gallery/gathering spot on the campus. Just as Miller and Jones are exploring movement, weight, and asking what does this new older shell do, Forti was rolling about on the ice on Evanston’s shore exploring the same movement and body concerns that have occupied her since the back hills of Woodstock while the counter culture raged around her. When she sat on the sidelines while Huddle was performed, I felt like I was living a timeline of movement, inside of Dance History. And dance history is a uniquely visceral subject since it is an art form almost entirely made of bodies. What all of these dancers are telling us through their rigorous endeavors, through their risky explorations, through their ongoing research and inquiry, is that we are human, we live in bodies, and these bodies age. And that is very interesting for us as a species. Just as much as we need cellular research into the aging process, we need whole body mind research on what it means to be physically on a time continuum. We need to keep exploring the terrain of all kinds of bodies and all kinds of being, and we audiences must witness and be present for the journey because we will be richly rewarded with knowing a bit more about being human.